Through a five-year saving process, The Greenskeeper found a way to reduce debt and reliance on loans for equipment. The Greenskeeper Hardscape Manager Seth Fortney, left, co-owners Eric and Leslie Allebach, and Maintenance Manager Landon Allebach. For the first 15 to 20 years of business, The Greenskeeper relied on loans when making big purchases. Or, any purchases. “We kind of used owning a business as automatically always having loans for everything,”says Leslie Allebach, vice president of The Greenskeeper. The company started small – Eric Allebach, Leslie’s husband, started The Greenskeeper in 1987 as a lawn maintenance business after he graduated from college. When he and Leslie were married in 1988, she joined him to help with office work. Both Eric and Leslie had business degrees, which helped with the startup of the business. Gradually, Eric added other services to the business – like hardscape and installation – as well as more crew members to help with the additional work. Yet as the company increased its customer base, it also increased its debt in equipment purchases. If they wanted to buy a truck, Leslie says they took out a loan. If they wanted to purchase a trailer, she says they took out a loan. About 10 years ago, Leslie read “The Total Money Makeover” by Dave Ramsey. The book addressed improving personal finance – something she initially read to improve the family’s personal finances – but it also offered some tips that were applicable to The Greenskeeper. She also started listening to Ramsey’s podcasts to learn about ways the business could decrease its debt. Eric and Leslie weren’t sure if Ramsey’s tips would work, but they decided to try. So, The Greenskeeper buckled down to be debt-free. The Greenskeeper gets 50 percent of its revenue by completing hardscape jobs. They first created a savings fund for equipment. Leslie says they wanted to have at least $20,000 in a savings account to purchase equipment as well as bump its savings account for payroll up to $10,000. To get to that point, she says they refrained from buying much new equipment or trucks for five years. With making any purchases, she says they often took advantage of 0 percent financing options to get new equipment without paying interest. They made sure to pay these off on schedule so that interest wouldn’t accrue. Their equipment fund hit the savings goal within five years. Leslie says they feel much more financially free with the fund in place. Now, The Greenskeeper is its own lender so the company doesn’t need to look to loans for new equipment purchases. Eric says they can purchase more in cash and resort to loans only for major things like land purchases. He adds that they also try to buy some used equipment where possible to help with costs. Don’t compare your equipment: Learn to be content with what you have while you work to get out of debt or become less reliant on loans. Set up automatic savings: Create an automatic savings plan with a special account that you can’t easily access. With the account they use, it takes three days to transfer money. This keeps them very intentional in using those funds. As you pay off loans, put those funds you paid every month into that savings account. If you could afford the loan, then you can afford to save that same amount. Take care of what you have: Don’t overlook the maintenance aspect on your equipment. Give each vehicle and piece of equipment as long of a life as possible when trying to save. Be patient: Little changes make a big difference, but you need to be patient. Debt-free companies don’t happen overnight. Since the company’s start, The Greenskeeper has grown steadily. It’s particularly expanded in the last decade as a result of its involvement in hardscape designs at garden expos. Eric says hardscape now makes up 50 percent of the company’s revenue. The company also outgrew its original office about 10 years ago, which was part of their house. With growth and more work coming in, the company added more employees. However, with labor being tight in recent years, Eric says it’s been very important to give back to employees to retain workers. Eric says he initiated an incentive program to help boost morale among employees. For example, if an employee worked for eight hours but performed 12 hours worth of work, Eric says he would pay them for the 12 hours of work as an incentive. It also encourages employees to work harder. “It was a way to motivate the guys and a way for them to make extra money without working overtime,” he says. Today, The Greenskeeper achieves about $3 million in revenue with 20 employees. In recent years, Eric’s son, Landon Allebach, and his son-in-law, Seth Fortney, joined the company. Eric says Landon is helping to lead the company’s maintenance division while Seth is helping to lead the company’s hardscape division. Hardscape products expand creative possibilities for landscape companies. Pavers, brick, cultured and natural stone are the foundation of an outdoor living room – literally, these design-build materials create the grounds for building functional, beautiful spaces in the natural environment. The range of products and creative applications implemented by landscape designers allow for surfaces and structures that complement surrounding buildings – or stand out as a statement. No two jobs are the same. “There’s a lot that goes into planning a hardscape project, but when you boil it down, most of it has to do with the final purpose – what the customer wants in the end and what their budget is,” says Michael Metcalf, a landscape architect at Kimberly Nurseries in Twin Falls, Idaho. From designing the project to selecting materials and managing the supply inventory, hardscaping can be a labor-intensive and complex division of a full-service landscape business. But it’s also an in-demand service, says Ben Carter, president of Carter Land Services in Brunswick, Georgia. Since Carter Land Services started its hardscape division eight years ago, its southeast market has kept crews busy with patio, driveway and walkway projects. This is not to mention the company’s proximity to one of the country’s largest hardscape suppliers. Tremron Pavers is just 50 miles away and provides easy access to supplies. This convenience eases the planning side of hardscape projects, Carter says. Before selecting materials for a project, Metcalf considers the ultimate use of the hardscape space. “If the homeowners are going to be out entertaining on the surface, you’ll want to go with something that is more acceptable for placing furniture or rolling a barbecue grill around,” Metcalf says, adding that a concrete paver would be a better option than flagstone, with its joints and uneven surface. On the other hand, a walkway in flagstone can add texture and character to a functional feature, so it’s useful and attractive. Natural stone slabs can form steps and add an organic touch to a concrete paver or cultured stone surface – and boulders can create outcroppings that are less manicured than an interlocking concrete block retaining wall. Designers weigh both function and aesthetics before selecting hardscape materials. Supply stock: It’s a good idea to use up materials like pavers and stone since they can change color as they weather and will be hard to match. Carter says more clients are asking for 4-by-8 brick, including reclaimed brick for an antique look in his area. “We have a nice market for reclaimed brick in this area, where old building bricks are salvaged and resold,” he says. In Metcalf’s Midwest market, more commercial and residential clients are asking for concrete pavers, and they’re using cultured stone for projects like outdoor kitchens. “We can select stone to match the house,” he says. But, you can’t forget the softscape and water, Metcalf says. The team at Kimberly Nurseries always looks at the end use of a project before selecting materials. While hardscape materials are readily available in Carter’s area of the country with a major supplier nearby, Metcalf says sourcing materials is a little more challenging in Idaho. “In the Twin Falls/Magic Valley area, there is a limited supply chain, so we try to go with materials that are made locally in the region,” he says. Metcalf has sourced materials from the East Coast where there is more variety, he says. But that can drive up the cost of a project. Ordering hardscape materials on a per-project basis prevents a buildup of inventory, which is basically money sitting on the shelf. Metcalf and Carter both source hardscape pavers, stone and brick as needed. “We naturally have material leftover from projects, so we created a very small amount of inventory that we can pull from to complete orders,” Carter says. Carter Land Services has two locations with a total of about 3.5 acres of yard. Carter is always checking on the buildup of extra product so those materials can be worked into upcoming projects. “We try to get rid of them within a few years because after they weather you can’t match them anymore,” he says. As for basic supplies to get jobs done – masonry sand, crushed aggregate, polymeric sand, etc. – keeping these products in stock is convenient, and since most projects require the same “ingredients,” those materials are eventually put to work. Edging material depends on the project and location. Because of the freeze-thaw activity Idaho experiences, Metcalf says Kimberly Nurseries prefers aluminum edging for exposed edges because it stays in the ground better in dicey weather. But in southern climates, this isn’t such an issue, Carter says. That’s why Carter Land Services applies concrete edging (not plastic, he says). Hardscape services are competitive, and between the growing DIY market and more contractors embracing property owners’ desire to create outdoor living spaces, landscape companies playing in this space recognize a need to maximize efficiency without sacrificing quality. Also, because innovative designs fetch a higher fee than basic surfaces, staying up on the latest materials and techniques creates a market advantage. “We go to trade shows and look at magazines,” Metcalf says, adding that his hardscape teams are certified with the Interlocking Concrete Paver Institute and have the Landscape Industry Certified designation from the National Association of Landscape Professionals. “We are always working on improving efficiency, and the biggest thing we have focused on in the last 10 years is making sure that our people are certified,” Metcalf says. Carter’s team is also ingrained in the industry, attending seminars and tapping into vendor education offerings, he says. “We keep up to speed on the latest products and installation methods,” he says. Hardscape is a creative base for stunning outdoor living projects, and landscape firms that are growing into this space or elevating their team’s skills will continue to redefine the market. Metcalf describes a project his team is about to kick off for the Clif Bar & Company headquarters. “We are doing bike pathways out of recycled, crushed concrete,” he says of one small piece of the sustainable landscaping initiative on that site. Find out what you’re working with by soil testing before you treat. Soil testing is an essential step in the care of any lawn or landscape. Without knowing what’s going on in the soil you’re working with, you can’t accurately develop an optimal plan for your clients. There are many reasons to soil test, says Tracy Allen, lab supervisor at the UMass Soil and Plant Nutrient Testing Laboratory in Amherst, Massachusetts. The first two may seem obvious: soil tests allow contractors to monitor both nutrient levels and acidity, or pH, levels of the soil – attributes that are key in the health of turf as well as annual and perennial plantings – and adjust them as necessary. But there are also significant environmental, financial and health reasons to soil test, Allen says. The pH of a location’s soil helps determine the proper treatments. As an environmental protection, many municipalities across the country have enacted restrictions against overuse of phosphorous and nitrogen-based fertilizers, and some areas now require soil tests to first establish the need for the fertilizer before it’s applied. From a cost-savings perspective, soil testing can boost your company’s bottom line, since it helps prevent the purchase and application of fertilizer when it’s not needed. 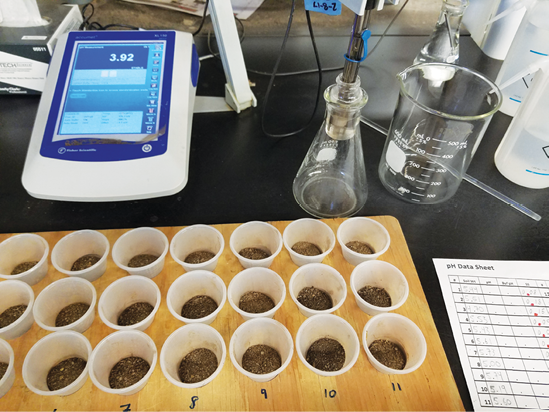 Because soils differ so greatly from one part of the country to another in terms of texture, acidity, and makeup, it’s best to partner with a soil testing lab in your region when possible. Many universities provide standardized soil sampling protocols tailored to their specific climate, says Bruce Hoskins, assistant scientist at the Analytical Lab and Maine Soil Testing Service in Orono, Maine. If a university soil testing lab isn’t available in your area, search for commercial labs that regularly exhibit or attend green industry conferences or trade shows, Darrah says. To stay abreast of what’s going on in the soil you’re servicing, plan to soil test routinely. If you’re working with a new space or are still in the process of identifying optimum fertilizer levels for a particular client, you may need to test as frequently as once a year until plants become established. “If you’re still trying to figure out the levels that your particular lawn needs, it’s good to have an annual soil test. But once you figure out the levels that the area needs, you can test every two or three years,” Allen says. Above all, don’t make the mistake of using soil testing only as a post-mortem response in the event of plant failure, Hoskins says. Ideally, you should soil test before planting. “If you’re putting in a new lawn or a new bed of foundation plantings, it’s really important to check the soil before you plant to make sure it is healthy enough to support plant growth,” Hoskins says. Then test again six months to a year after installation. “If everything is OK after that, a maintenance-type application would include testing every two to three years or so – unless you’re dealing with a golf course and greens, which typically test every year,” Hoskins says. The point of repeated testing is to understand the ongoing interplay of the plants and the soil over time. Career fairs can be intimidating for students and recruiters alike, but they're great for getting your foot in the door. When Kurt Bland first sought a full-time job after college, he went to a career day in Mississippi. While he eventually would return to manage Bland Landscaping, the company his parents started when he was an infant, he wanted to leave North Carolina after graduation because he desired experience at a company that wasn’t owned by his family. He thinks about this each time he attends or hosts a career fair. He’s looking for prospective new employees who approach these events similarly to how he did right out of school. Bland likens the process of handling a career fair properly to dating. Finding the right fit, whether it’s a significant other or a company, comes down to thoughtfulness. Career fairs can help you land a job with a company that fits your interests, or they can be a waste of your time and efforts. Those who have been on the other side of the recruiting booth offer their advice on how to make sure your job-hunting experience is a positive one. Bland says professional attire and a smile go a long way, but there’s more to it than that. Milosi Landscaping’s Carynell Carlton says an experienced candidate is noteworthy, and students should be able to discuss some of their previous work. An impressive resume is memorable, and Carlton says the last time Milosi hired somebody right out of school, the candidate was able to show what he had learned outside of the classroom on his resume. His portfolio felt out-of-the-box, and he had pursued clients beyond classwork. Interviewers also want to hear about your passions, but Carlton says she’s looking for people who tend to be environmentally conscious. Time spent with a leadership coach or class can’t hurt, she adds. Hall also says a passion for being outdoors will help, as will more physical hobbies like rock climbing and hunting, which show a willingness to put in hard work. Keeping all that in mind, being yourself is most important. Career fairs can be intimidating, but Hall says you should calm down before you even walk through the door. Answering questions honestly helps companies find candidates they like, but it also helps you figure out if the place you’re talking with will be a good fit. 1. Advertise properly: Jessica Lamb of The Pattie Group assembles an annual career fair, and she recommends sending out information whether you’re attending or hosting. Press releases, social media posts and sending details to local schools are all excellent ways to get the word out. 2. Bring the right materials: Lamb brings in visuals and keeps it light with games, food and giveaways. Carynell Carlton of Milosi Landscaping brings career path materials with her to fairs, hoping to convince candidates that there’s room to move up. 3. Location matters: Bland Landscaping’s Kurt Bland says he won’t attend a career fair if his company receives bad spot. A table by the entrances or exits on the show floor is prime, while being stuck in the back corner may not be worth your time or money. 4. Best practices: Hall recommends consciously smiling while standing there, even if you’re bored or nervous to answer questions from recruits. Within 30 seconds of initial interaction, Bland says he can tell whether or not you’re actually interested in his company. He says sometimes people go to fairs for the social component or because they’re forced to, not because they’re trying to find a job. With so many people to sift through before the day ends, he can only spend so much time trying to figure out if you’re interested. Bring resumes, cover letters and portfolios – that’s critical. Bland also recommends doing research on some of the companies that are going to be at the career fair. Knowing where the businesses are located is important, but what could help you stand out is being able to ask a few questions about some of their previous projects. Carlton also says showing you’re interested in working your way up through a long-term career path is important, too, because many interviewees say they want leadership positions but aren’t qualified yet. Knowing what it will take to get to that point is important research to have but expecting those higher-paying positions right away might be misguided. Hall says career fairs are conversations, not formal interviews, so you should have some questions ready to ask recruiters. She says asking about company culture shows you care about workplace environment, plus it helps you determine if you’d like working at that company. Asking somebody what they love or would change about the job is effective, as is asking about what an average shift might look like. If you’re not attracted to the company after hearing the answers, it’s still good information because your own interests may change. “Even though a company may not look like it’s the place for them right now, you never know in the future, three, five, 10 years down the road, that the company might have a position that you’re interested in,” Hall says. Carlton says inquiries about starting salary are important, but candidates should also ask about benefits like insurance and retirement plans, plus paid time off and overtime opportunities. Selling today is aided by specific tools that make our lives much easier. We’re obviously well in the midst of a digital era in the United States. Our lives have been consumed with a vast array of electronics, personal computers and software tools designed to automate our lives. Late Gen Xers and early Millennials have seen the greatest changes, including the rise and fall of many great companies. Our generation ushered in social media with platforms like chatrooms and Myspace. But no one really knew how communication was going to change over the next couple of decades. I personally remember my mom getting irritated because of long-distance phone bills from calling friends, while kids today easily pick up their smart phones and send a Snapchat for free. While we’ve all had to become more responsible for time management, it’s undeniable that technology has helped improved our lives, often saving us time and money. These tools can be an even greater benefit if we integrate them into a structured process. Today, we have tools like customer relations managers (CRMs), email software and social media platforms to help us be more efficient. There are also ways to integrate these tools so that they all work together to achieve your sales efforts. While most business owners are willing to use new tools, I find that many are unaware of what is available to them and their sales staff. Let’s be honest, who can keep up? That’s why I want to highlight five key sales tools that may help your team create more leads and close more sales. Keep in mind this is not an all-encompassing list. I would recommend that you examine your company and staff and research what tools can be integrated into your processes to support your goals. These tools track your interactions with prospects and clients. They often have mobile apps that will track calls and emails, logging them into the customer’s profile. For sales, I prefer CRMs focused around the sales process and pipeline development. Email software is an easy way to send out professionally designed emails promoting your brand values to clients. Many of these tools have automated processes that can be integrated into your website, such as welcome emails or even an email explaining your proposal process. Depending on your market, social media is a great place to help build your online presence and showcase work. You can do anything from prospecting to showcasing project highlights. Consistency in social media is key. Information is power and most don’t realize there is an abundance of information on websites. There are tools that can be used to target and collect data from websites and social media platforms. You can often pull data such as emails, phone numbers and address for individuals who could be your contact about contracting for services. I have always tried to push for an in-person presentation for prospects asking for a quote, but in today’s age, that is becoming less and less viable. Be prepared – whether presenting in person or online – to make sure that your values are communicated. These tools may seem intimidating at first, but most are very user friendly with a library of videos and training material to help with integration. I would identify one of your team members to champion the process and help others. While these aren’t the only tools to support your sales staff, they can serve as the core of your sales process. If you have these areas covered, I would encourage you to explore other areas of your company and see what digital options may be out there to improve processes and profits even more. Editor’s note: The author’s recommendations are his own opinion and not those of Lawn & Landscape magazine. Darnell receives no financial compensation from any of these companies.